Fruit and nut bars sound healthy, and in some cases they are, but not all of them are created equal. By themselves, dried fruits and nuts are nutritious and supply key nutrients you need for good health, but the other ingredients in the bar can make or break how healthy they are. Most fruit and nut bars, because they contain dried fruit and nuts, are a good source of fiber. 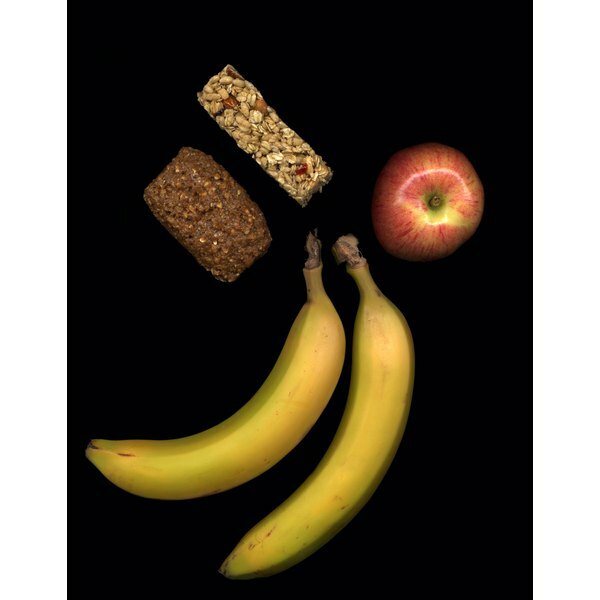 For example, a soft nut-and-raisin granola bar contains 1.6 grams of fiber. That's about 6 percent of the 25 grams of fiber women need each day and 4 percent of the 38 grams men need on a daily basis. Depending on the ingredients, other fruit and nut bars might have more or less fiber. The nuts in the bar are a good source of heart-healthy unsaturated fats, as well as vitamin E, an antioxidant that protects your cells. Many fruit and nut bars contain unhealthy saturated fat and sugar. Too much saturated fat can lead to high cholesterol, which increases your risk of heart disease. Large amounts of added sugar can lead to unhealthy weight gain, which puts you at a higher risk for type-2 diabetes. A nut and raisin bar contains about 2.7 grams of saturated fat, and the average fruit and nut bar can have as much as 8 grams of sugar. A fruit and nut bar with chocolate can have as much as 21 grams of sugar, with most of it as added sugar. Fruit and nut bars can contain between 120 and 190 calories each, and too many calories can lead to unhealthy weight gain. When it comes to buying a prepackaged fruit and nut bar, the key is to read the nutrition label and ingredient list carefully. The most nutritious prepackaged fruit and nut bars are those that are low in sugar and high in fiber. For example, a bar with 8 grams of sugar and 3 grams of fiber is far healthier than a bar that has 21 grams of sugar and only 1 gram of fiber. Bars made with oats and other whole grains are usually better choices because these ingredients are good sources of fiber. When you make your own fruit and nut bars, you're able to control the ingredients you include, which can make for quite a nutritious bar. Choose unsweetened dried fruit, which contains only healthy naturally occurring sugar and doesn't contain the unhealthy added sugar. Unsalted nuts are also a good idea because too much sodium can raise your blood pressure. Dark chocolate is better than milk chocolate, if you must have the candy, because it's usually lower in sugar. Whole oats, whole-wheat dry cereal, flax seeds and chia seeds are additional ingredients that are nutritious.